The 918 is very well located and is just off the Old Delhi - Jaipur Highway. On one hand there is no noise disturbance and on the other hand it is just behind Infospace (SEZ) and very close to Udyog Vihar (Industrial Area). 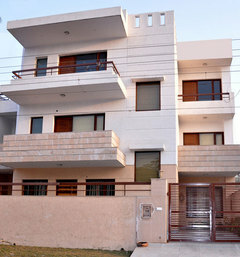 * 918 Home Stays is a newly constructed B&B Establishment. * All the rooms are equipped with split air conditioning systems and 32 inch LCD televisions (In-built USB Ports). * The entire property has marble flooring, artwork and paintings and tasteful and expensive furnishings. * The rooms are large and of a generous size. * All the rooms have closet and a chest of drawers which provide for adequate storage space for guests. * Efficient staff for housekeeping, maintenance, security service are deputed at the property. 20 Mins distance from the International Airport.